All Saints Catholic School offers a wide variety of enrichment activities for our students during and after the school day. The Athletic Program offers seasonal physical challenges for our students. Sports programs for middle-school boys and girls include soccer, cross-country, track and field, basketball, cheerleading, softball and baseball. “The Saints” have been recognized for their performance, success and sportsmanship, which fosters team and school spirit. MathCOUNTS is a national math enrichment program to promote middle school math achievement. Students meet twice per week to prepare for local competition. All Saints teams have gone on to state-wide competition. Scouting Troops for boys and girls enrich our strong Catholic-based values by teaching life skills and the importance of community involvement. Age-appropriate levels of scouting are offered depending on the availability of troop leaders. Chess Team at St. John’s campus is an after school activity designed to develop students’ logic, strategic thinking, and etiquette while playing this complex game. Chess team is a program for students in 2nd to 8th grade who already know how to play chess. Students learn how to play competitive chess and encouraged to compete in local tournaments. 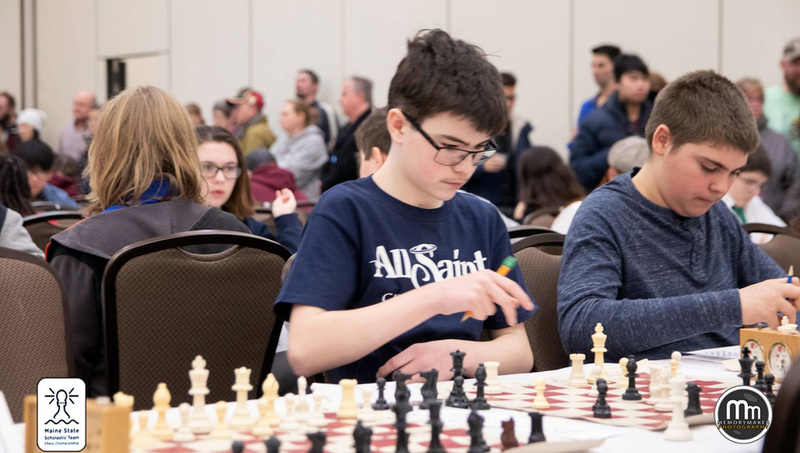 The chess team hosts a tournament every February in preparation for the Maine Scholastic tournaments in April. All Saints has had many successful teams and players including winning team and individual honors. Yearbook is an exciting opportunity for middle-school students to capture and share memories of each academic year. Students take an active role in photography, design and the artwork of their publication. Children’s Choir fosters the joy, discovery, creativity and discipline of musical presentation. Both St. Mary’s and St. John’s churches support youth choir opportunities for youngsters (reading age to grade 8) to experience a solid introduction to the concepts of singing as part of a group, rhythm skills and participation in a church service. Knitting Club is one of the newer clubs at All Saints. Led by Ms. O’Shea, students learn to knit everything from scarves to blankets year round. Field Trips are planned with educational and/or social development objectives as the focus. These activities reinforce our curriculum goals by offering enjoyable, life-learning experiences. The Youth Symphony at the Maine Center for Performing Arts, the Farnsworth Museum in Rockland, the University of Maine’s planetarium, Leonard’s Mills Living History Day and a visit to an apple orchard are just some of the field trips that have been offered to students. Class trips are also included as they pertain to the curriculum.